All humans like to tell stories, so here’s mine. It’s the story of how I became The Special Storyteller with the help of a bunch of amazing teenagers with special needs and a grumpy old Bogeyman called Stan. The Special Storyteller was born in The Wilds of Wongo (or Sunderland as the locals call it) in nineteen seventy mind-your-own-business. Brenda and Eddie Wells, his battered and bruised parents, decided to call him Pete so that he would not grow up with the stigma of having silly names like they had. It was an epic birth; sadly, there was no room at the Inn, so Pete had to be born in the hospital next door. Far away, three visually impaired mice had been told to follow a star by a local angler, to find this special storyteller. Obviously they couldn’t see the star, or indeed understand English, and so they ended up going to the local Aldi instead. Eventually, the mice chanced upon the hospital, and, stuck to their fur, brought bits of Terry’s All Gold, some frankfurters and Myrtle, a young turtle they’d met. They also brought MRSA, which has been a fascinating feature of British Hospitals ever since. 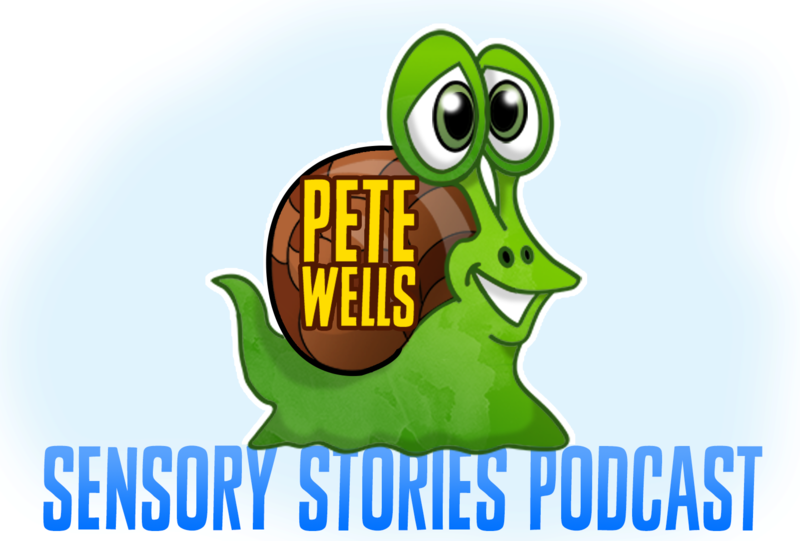 During Pete’s early adventures in the classroom – adventures that he is proud to continue to have to this very day, he found Sensory Stories, and instantly fell in love! I believe it was the feather duster he found particularly attractive. The stores were great and Pete could really see the benefits of letting his children experience, explore and anticipate a range of wild and wacky props. However, Pete wanted to tell his own stories, ‘cos all humans like to tell stories, and also one or two of the teenagers in his class wanted more grown up tales. That’s teenagers see? Never happy! Pete stole the props from the legendary Bag Books’ Granny’s Visit story and wrote Bogeyman Stan. The titular villain of the piece was named after Pete’s Uncle Stan, who had also been one of the victims of the family tradition of having silly names. In Pete’s story, the sponge that was used to wipe the table in preparation for Granny’s visit, became Stan’s rough tongue as he licked the faces of his victims! The innocent little brush that was used to do the dishes for Granny became the bristles on Stan’s stubbly chin; three chilling knocks on the funky letterbox prop became the terrifying moment that Stan arrives at your house, and so on. Pete had defiled a classic story, but his teenagers were happy and that was the main thing. Bogeyman Stan became a bit of a monster, well, even more of a monster, as he took on a life of his own as characters from stories often do. He started messing up our sensory cooking lessons as we made green bogeyman jellies and kidnap cakes; he infiltrated our numeracy lessons as we counted his stinky toes and opened doors to see which one he was hiding behind; he stomped all over our computing lessons as we made pictures of him with switches and practiced his burps on the BigMack; he even turned up in our massage sessions, pummeling and squishing the students. Telling his story evolved too – Stan had become a right old diva and, not content with just being words and props, wanted to be pictures too. Not any old pictures though, he wanted to be moving ones on the computer, and not being one to argue with seven foot bogeymen, Pete had no choice but to draw and animated him. However, the beauty of this little arrangement was that for the first time ever, Pete’s STUDENTS could use switches to tell the story. You see, all humans like to tell stories. Stan soon demanded that he be put on that new fangled internet so he could explore other schools and terrify other children, in what could be argued as one of the earliest recorded cases of cyberbullying. As Stan spread around other educational establishments, so did Pete, as he got to swan about telling his tales and helping teachers to make their own. Over the years, Bogeyman Stan changed to Sheldon the Snail, to Gobbin Hood, to Sir Praceabout, to Gerry the Germ, Webster the Witch and dozens of other silly and not so silly characters that have helped children explore, develop and most of all, have fun! which I think was Stan’s interntion in the first place. See? He’s a bit of a old softie really is Stan, but don’t tell him I said that. All humans like to tell stories and, thanks to Stan, I now have loads to tell. Why not let me come and tell you some, perhaps we’ll even make one or two of our own!